we finally get to reveal our finished projects to the world, well at least to the rest of the Bead soup Group. Ha , the best laid plans don't always work out the way we thought they would. I fiddled and diddled and fiddled some more. A gorgeous ceramic leaf focal, ceramic/raku rounds, creamy fossil stone, large smokey quartz, faceted amethyst, and a hammered copper toggle clasp. My original idea was to use the layout you see here (above), I thought it made a lovely choker style necklace. That didn't work out so well. it's less than a week till my reveal day for the Bead soup blog Hop and I'm still working on my pieces . I have a design in my head that is NOT coming to fruition as i want it to , so i may have to backtrack and choose an alternate route. We'll see what happens as i create in my studio today. well I finally got back here to update what's happening with the Bead Soup blog hop. I received my soup from Nikki and she has received hers. We are awaiting our reveal date. we are in the third group.our reveal hop is next saturday april 20 so check back then to see our finished pieces. I recently joined Lori Anderson's Bead Soup Blog Party. My soup partner is Nikki Banham -Hall from the UK. 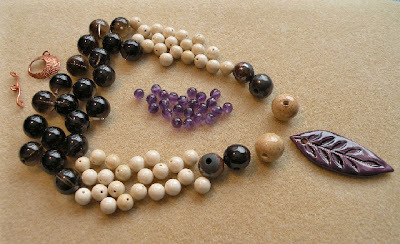 We will be sending each other a selection of beads with which to create a piece of jewellery. I can't wait to see what I receive from Nikki and I sure hope she likes what I'm sending her. Once she receives her package I can show a photo of what I sent her plus a pic of what she sent me. Check back In a week or so, the postal system can be a tad slow.